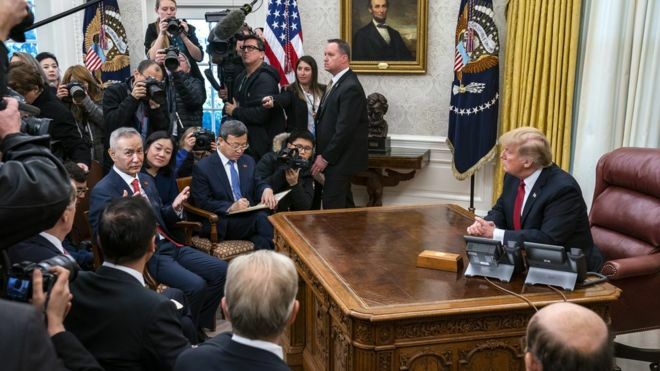 Bloomberg reports, "President Donald Trump said negotiations are going well on the last day of high-level trade talks between the U.S. and China but that no deal will be final until he meets with Chinese President Xi Jinping. 'Meetings are going well with good intent and spirit on both sides,' Trump said in a tweet Thursday. 'No final deal will be made until my friend President Xi, and I, meet in the near future to discuss and agree on some of the long standing and more difficult points,' Trump said in another posting. U.S. Trade Representative Robert Lighthizer will lead a second day of negotiations Thursday with Chinese Vice Premier Liu He, the highest-level talks since Trump met Xi on Dec. 1 and declared a 90-day truce aimed at reaching a lasting deal to end the trade war. Trump is scheduled to meet with Liu later in the day." The Washington Post reports, "...Leading up to the meeting in Washington, China accelerated plans to introduce a new foreign investment law that will tackle some of the key sources of friction with the United States by banning forced technology transfers and better protecting intellectual property rights. The National People's Congress, China's rubber-stamp parliament, will vote on the foreign investment law, which will replace three existing laws, during a session scheduled to open on March 5, the official Xinhua news agency reported Wednesday. It is sure to be approved. 'There is an urgent need for such a unified law to provide stronger legal protection for further expanding, opening up and better using foreign investment,' Justice Minister Fu Zhenghua told lawmakers when introducing the draft during a special two-day session of the Congress's standing committee this week." CNN reports, "Chinese methane emissions are rising at an alarming rate despite recent government regulations aimed at curbing the climate-changing pollutant, a new report has revealed. A study released in the journal Nature on Tuesday shows a steady growth in China's methane emissions, primarily from the country's massive coal mining sector, undermining Beijing's claims to be leading the world on climate change action. 'Methane emissions in China appear to be increasing, business as usual. We were unable to detect any impact of regulations on the country's methane emissions,' the report's lead researcher Scot M. Miller told CNN...In 2010 the Chinese government enacted a series of new polices requiring methane from coal mining to be captured, or to be converted into carbon dioxide." Reuters U.S., China take the lead in race for artificial intelligence: U.N.
RealClear Politics Will Trump Flub the China Trade Talks?